Straw is a natural, renewable resource.The efficient supply of energy based on the renewable resource straw. 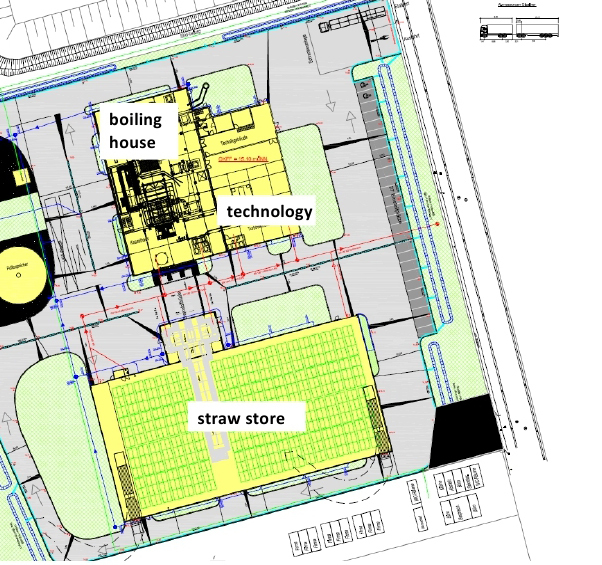 A concept to install a heat and power plant for a sustainable heat & power generation by using the renewable resources straw.In addition to this ecological benefit there are several other advantages using straw in comparison to the fossil energy resources. One of them is for example the locally added value. The economic benefit applies to the whole supply chain which could be especially interesting for areas with a weak structure. The funds strengthen the local companies instead of draining away in fossil fuels like coal, oil or gas. A significant development in the knowledge about the energetic use of straw took place in Denmark in the eighties. The technology of straw power plants was discovered. The aim was to support the use of the local sources andreach to a decentralization of Denmark’s energy production. One of the oldest power plants (Rudkobing) exists for over 20 years and is successfully in operation since that time. The most modern straw-fired heat & power plant has been real-ized in the Germany and was built based on Danish technology. This power plant is in operation since 2013 and is significant for its tech-nical improvement and its high en-ergy efficiency. Likewise the Danish plant it’s the target to produce sus-tainable energy for the future. The knowledge of this project is tak-en to present below the technology of using straw for energy generation. The physical features from straw cause special requirements for the burning technology. The low ash-melting point is one of these compared to other types of biomass. It is just 700-750°C. This point of wood is in example over 1000°C. The conventional furnaces temperatures over 1100°C would inevitably lead to slagging with-in the boiler. Beyond that even the presence of chlorine in straw requires special construc-tive and process changes to avoid corrosions during the low- and high-temperature ranges. The advantages of straw as fuel are the less disturbance variables what is a benefit. Finally you can reach a plant – availability very comparable to conventional power plants. This simplified site layout shows the essential plant area which requires a straw power plant for a fuel-heat-capacity of about 50 MW. The outlined straw store above is about 65 m long. The total plant area should have an area of about 100 m x 150 m which include the neces-sary traffic areas. The illustration below demonstrates the functional principle of a straw power plant. The base of that process is the classical “Clausius Rankine”-process. 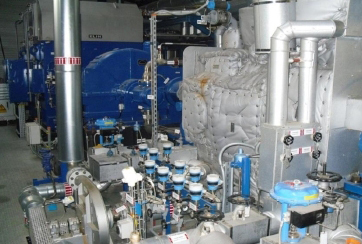 While this process a vapor with high temperatures and pressures is produced by a straw boiler (nature circulation boil-er) and is taken to generate electricity by a steam turbine connected generator. The heat can be provided as steam or heating water depending on the performance of steam turbine. Thus it offers the possibility to provide industrial processes or also district and local heating grids. This heat & power plant achieves a high overall efficiency over the total process. The straw is conveyed from the storehouse (1) via the bale-hoop-opener (2) to the boiler house, where it is burned on a special vibration grate (4) cooled by water. The vibration combined with the cooling prevents slagging of the burning fuel. Afterwards the ash is hauled by the wet ash remover (5) out of the boiler. The flue gas is cleaned to reach the emission limit demands. That implies that the injection of additives absorbs for example chlorine compounds which can be separated efficiently in addition with dust and other un-burnt materials by the fabric filter (11). 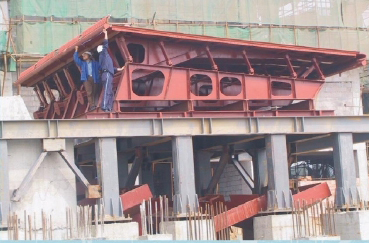 The heat which is generated in the furnace is used to vaporize the water by the boiler walls (3). The separation of feed water and steam happens in the steam drum above the boiler. The saturated steam is superheated within the downstream super-heater (6) up to a tem-perature of 522°C. The picture was made in the straw power plant in Germany. 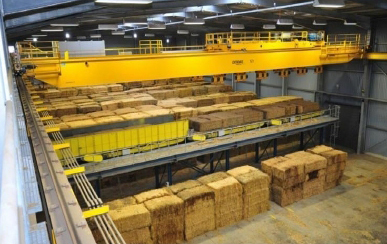 About 1200 t straw can be stored on an area of about 2700 m². If the average requirements are 250 t straw per day, this straw quantity would be enough to run the production five days in a full-load operation. The speciality of this plant is that it is able to work with bales dif-ferent sizes unlike the plant in Denmark. According to this the height of the bales could be be-tween70 to 130 cm. The width of the square bales is always about 1.2 m. This size-range enables to use almost every major straw baler which is common in agriculture today. In this way the straw purchase is simplified considerably. The further transport proceeds via a fuel-bridge to the boiler. There are two conveyor-lines at the German power plant, which ensures that even if one of them breaks down there is still nominal output of max. 75%. According to Danish studies 80% of disturbances are caused in the area of fuel supply; therefore this redundancy of construction! At first the hoops of the bales are cut at the end of the fuel-bridge. Afterwards the straw arrives at the bale-bulking-device and the bulk straw is conveyed by Stokers to the boiler. The vibration grate is cooled by water to prevent a slag formation of the straw during the process. The burning fuel is conveyed further and finally arrives at the wet ash remover, be-cause of the oblique position of the grate and of the cyclical vibration powered by a special construction-development of motors. The straw boiler is built as a natural circulation boiler. The water which reached a high level of pressure caused by the feed water pump vaporizes in the walls of the boiler. This vapor is heated up to the final, required temperature by the super heater in the steam drum and is fed to the turbine. Straw has an ash content of 5-6% which is significantly higher than the one of wood for ex-ample. (The ash content of wood: appr. 1-1.5%). The main ash part arises as bottom ash (re-sulted by the wet ash remover). If there arises a demand on the use of other fuel qualities too it would be possible to fire wood chips up to an amount of 50 % (of fuel mass). But there are disadvantages because of a more difficult process-operation, a less exactly load control and especially a worse re-use of that new mixture of ash. By using pure straw, as it is the case in Germany, the ash can be reused as fertilizer on fields, as the high content of potash is very interesting for farmers. And finally you have reached a real recycling economy. A dry sorption process with a downstream fabric filter has shown as the best solution to pu-rify the flue gas. Especially the dust emissions are then a multiple below the required emis-sion limits according the approved licenses. Steam with high temperature and high pressure is led from the straw boiler to the turbine where an isotropic steam expansion takes place. At that time the mechanical power is changed into elec-trical power by the steam turbine-generator. Depending on the requirements of the power plant utilization the heat can be extracted as steam if the turbine has the appropriate performance. 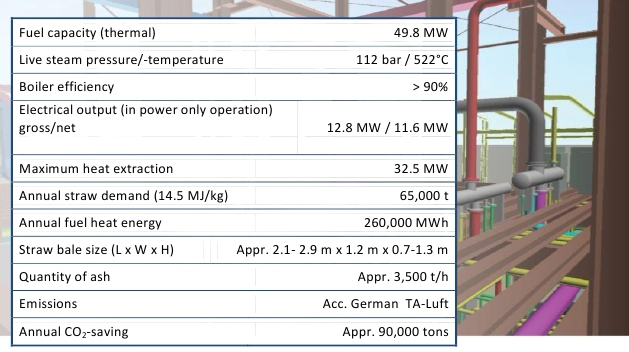 In conclusion straw-fired power plants offer next to the generation of electricity multiple possibilities to substitute fossil fuels also in the heating sector according to this presented concept. In brief: a sustainable, environment-friendly technology and thus extraordinary viable for the future!